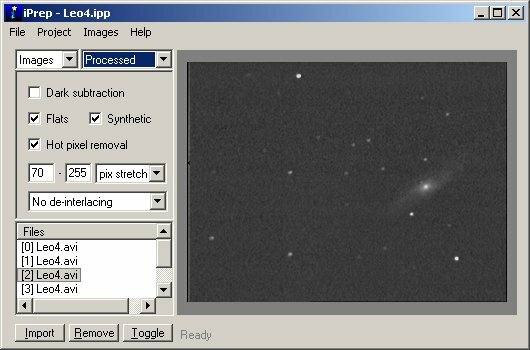 iPrep is an interactive image preprocessor. 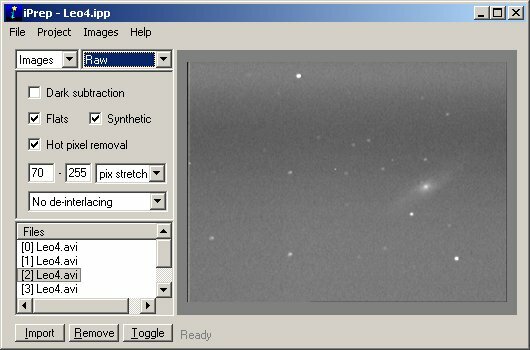 It deals with the correction of common long exposure imaging defects, operating on a collection of source images and allowing the selection of a variety of pre-processing algorithms. The results are visible in a preview window, allowing the processing parameters to be fine-tuned prior to saving the final results. Import/export image files in AVI/BMP/FIT format. You can also download a sample iPrep project, demonstrating some of its capabilities. A raw image frame. Note the gradient. The same frame after application of a synthetic flat, correction of a couple of hot pixels, and a bit of a stretch. You may not sell or re-distribute iPrep, but you may download it from this site or publish links to this page. iPrep is downloadable for non-commercial use, as 'conscience-ware'. This is not the same as freeware or shareware. iPrep contains a link to this page from the 'Help->Payment' menu option, should you wish to return here in the future..
iPrep est gratuit pour télécharger. Si vous le trouvez utile vous pouvez m'acheter une bière virtuelle en faisant une donation de quelques euros. Cliquez le bouton de Paypal ! iPrep ist kostenlos zu downloaden. Wenn Sie es nützlich finden, können Sie mich kaufen ein virtuelles Bier, indem Sie eine Abgabe einiger Euros geben. Klicken Sie die Paypal Taste an!